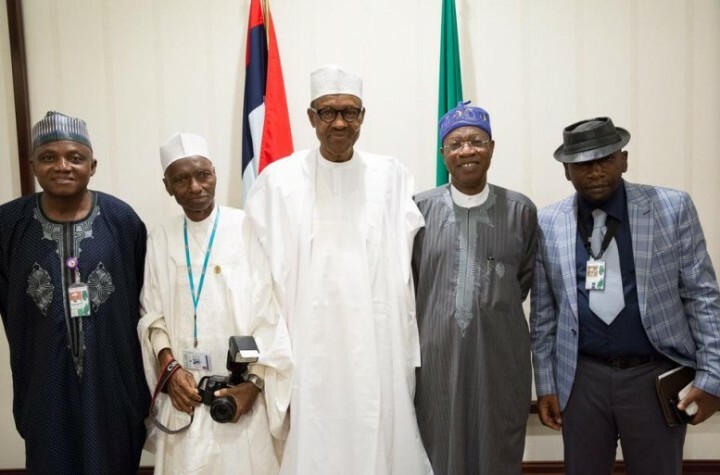 President Muhammadu Buhari challenged journalists to always conduct research on crime-related issues before publishing. The President said this on Monday when he hosted members of the State House Correspondents to an anniversary lunch. The President said the call had become imperative in order to ensure accurate and factual reportage of such issues. Buhari made reference to the ongoing efforts by the Federal Government to recover Nigeria’s stolen funds. He said only investigative reporting of the events would enable the public to understand and appreciate the implications of such criminal acts. “How do you define change? Luckily, our party identified three major items, security, economy and corruption. “So, please when next you want to interrogate out visitors try and do some research so that when they are coming next time, they will do research themselves’’, he said. He, however, stated that efforts had been intensified to get the international community’s support towards full recovery of the diverted 2.1billion dollars given by the then government then for purchase of military hardware to fight insurgency. “They just sat, just the way you are sitting now, and shared the money into their own account. “They didn’t even bother. So, we are still trying to get the cooperation of the international community and we have to do it with a lot of respect to the judiciary. “We cannot go out and talk too much. We have to allow the judiciary to do their work. We will give them the facts, the name, country, bank account. “If you talk too much, technicalities will come in, then, we will realise less than what we want to realise,’’ he said. Buhari described the first one year in office of the All Progressives Congress-led administration as a tumultuous year for everyone in the villa. “I will talk about my experience here in Aso Villa. I underrated the influence of the PDP for 16 years watching from outside ar eight consecutive governments. “The experience of the staff, their commitment and zeal is different from what it is now. Sixteen years of development in the life of a developing nation is a long time. “When we came, there were 42 ministries and we cut them to 24. “This is where I pay my respect to former President Goodluck Jonathan. This is actually privileged information for you. “He called me at a quarter past five in the evening. He said good evening, your Excellency Sir, and I said good evening. He said, `I have called to congratulate you that I have conceded defeat. Of course, there was dead silence on my end, because I did not expect it. I was shocked. “I did not expect it because after 16 years, the man was a Deputy Governor, Governor, Vice President and was President for six years. “For him to have conceded defeat even before the result was announced by INEC, I think it was quite generous and gracious of him. So, I thank him for that. “(Former Head of State)Abdulsalam recognized the generosity of Jonathan to concede defeat and said we should go and thank him immediately and that was the first time I came here’’, he said. He said that the issue of padding made the budget process more difficult for him and members of the Federal Executive Council (FEC), as some of them heard about padding for the time. “Things were even more difficult during the budget which you all know about. For somebody like me, for the first time, I heard what is called padding. “So, really, it was a nasty experience for us. It was also a nasty experience for some of the ministers who were never in government, for them to sit down day and night to work. Buhari acknowledged that the country’s reliance on one commodity, oil, had adversely affected the nation’s economy. Chairman of the State House Press Corps, Mr Kehinde Amodu, commended the President for his support and showing more understanding in his dealings with members of the corps. The lunch was attended by the Minister of Information and Culture, Alhaji Lai Mohammed, Chief of Staff to the President, Alhaji Abba Kyari and Alhaji Jalal Arabi, the Permanent Secretary, State House. Others were Malam Garba Shehu, the Senior Special Assistant to the President on Media and Publicity and the press corps.